Home Technical What is happening to the sun? New research suggests that the sun may be on the verge of changing its sunspots in a way that could significantly alter its influence on Earth and in space. Two recent articles I read prompted me to delve a bit deeper into what is happening to the Sun and its effects on the Earth – specifically on radio wave propagation. It was reported in NEW SCIENTIST (26 Sept. 2012) that structures in the sun’s corona indicate that the peak in the current cycle of activity , Cycle 24, have been and gone, at least in its northern hemisphere. An article entitled “Solar Cycles and F-Layer Propagation” by Jim Kennedy K6MIQ/KH6 in RadCom March 2013 further explained how the individual northern and southern hemispheres of the Sun do not generally behave in the same way at the same time. The sunspot counts for the two hemispheres after the solar minimum between Cycles 22 and 23 showed a phase shift of about 10 months during the climb to Cycle 23 peak. Both hemispheres had started to rise at about the same time towards the end of 1997 then two years later the southern hemisphere stopped rising for a period of about 10 months, after which it never caught up with the northern hemisphere. This resulted in a double sunspot peak for Cycle 23 and a 2 year phase shift at the start in the start of Cycle 24. Furthermore the northern sunspots did not start to increase until the southern spots started. You will all remember that we had a very long sunspot minimum and wondered if the Sun was ever going to kick-off again. 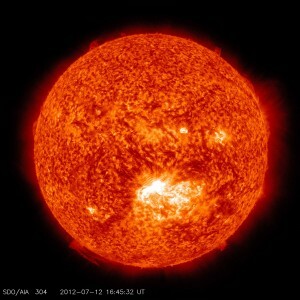 Following the unexpectedly deep minimum from 2008 to 2010, solar physicists predicted a weak maximum for 2013 An especially weak solar maximum took place in the sun’s northern hemisphere around July 2011. The southern hemisphere, is now on a sluggish rise to solar maximum and may not hit its peak until 2014. Coming years should prove to be very interesting as three studies presented by scientists at a conference in Las Cruces, New Mexico recently predict that sunspots are set to temporarily and unexpectedly vanish as part of a solar “hibernation” period that could last for decades and, prompting weaker future solar cycles. The large difference between hemispheres could be a sign of big changes ahead. Such a situation precedes an extended quiet phase called a Grand Minimum which can last for decades. 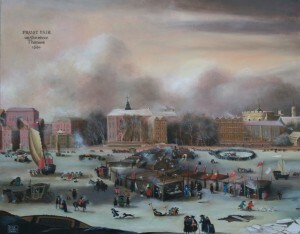 The previous one took place between 1645 and 1715, and has been linked to the little ice age in Europe. A new one might also cause localised cold periods. Some scientists are not convinced that this will happen. They think that this present cycle is similar to the weak one that ended in 1913, which was followed by a strong cycle. I find that if you ask a researcher why such and such a phenomena exists you will often get the answer “ We do not know but we are working on it”. However, Jim Kennedy’s article provides more detail and explanation on solar cycles. I recommend it to you as a basis for further study. From 1645 to 1715, at a time when there were lots of optical astronomers, there was a drastically reduced number of recorded sunspots. This period of reduced solar activity, which was first noticed by G. Sporer and was later investigated by E.W. Maunder, is now called the Maunder Minimum. This period of time was also unusually cold on earth, and it has been referred to as the “Little Ice Age.” This has led to some speculation that sunspot activity may affect the earth’s climate. Similar periods of low solar activity seem to have occurred during the Spoerer Minimum (1420-1530), the Wolf Minimum (1280-1340), and the Oort minimum (1010-1050). We have no records of the effect of Grand Minima on ionospheric propagation because Maunder lived two centuries before Marconi. The latest research indicates that solar phenomena other than sunspots may be at play. Researchers have found the Sun’s eleven-year solar cycle continued normally during the Maunder Minimum between 1645 and 1715, when sunspot activity was unusually low. Sunspots appear to be a symptom, not a cause for the solar cycle. Jet streams on the sun’s surface and below are also early indicators of solar storm activity, and they haven’t formed yet for the 2020 cycle. That indicates that there will be little, or delayed, activity in that cycle. On the basis that ionospheric propagation depends directly on the sunspot count, Cycle 25 is not looking too good.